Susan Elbe is the author of the chapbook Light Made from Nothing (Parallel Press, 2003) and Eden in the Rearview Mirror, which is forthcoming from Word Press in 2007. Her poems appear or are forthcoming in many journals, including After Hours, Ascent, CALYX, Crab Orchard Review, MARGIE, Nimrod, The North American Review, and Passages North. 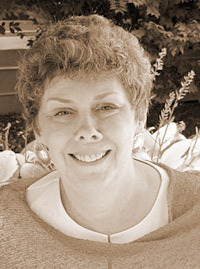 Her work also appears in many anthologies, including A Fierce Brightness: Twenty-five Years of Women's Poetry (CALYX Books, 2002), Family Matters: Poems of Our Families (Bottom Dog Press, 2005), and Kiss Me Goodnight: Stories and Poems by Women Who Were Girls When Their Mothers Died (Syren Book Company, 2005). She has been awarded the Lois Cranston Memorial Poetry Prize from CALYX and a Rowland Foundation residency to the Vermont Studio Center. Elbe currently serves on the Council for Wisconsin Writers Board and was recently appointed to the Wisconsin Poet Laureate Commission. She lives and works as a Webmaster in Madison, Wisconsin.